the award at the 36th FISITA World Automotive Congress in Busan, South Korea. 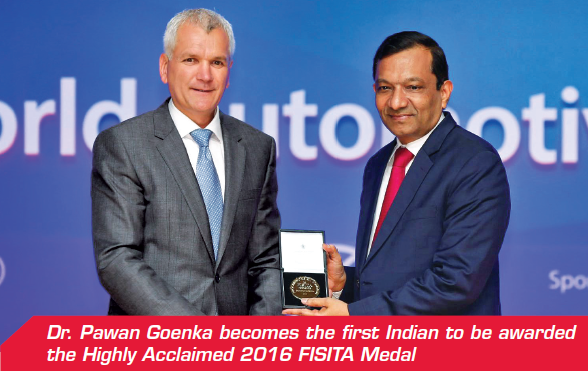 The accolade was awarded in recognition of his “particularly distinguished achievement and leadership in the global automotive industry.” Goenka is the first Indian to receive this prestigious recognition. He is considered the father of the Mahindra Scorpio and has successfully led Mahindra & Mahindra’s automotive and farm equipment businesses before taking on a larger role in the company as its Managing Director. He is also known as the “prime architect” of SAE India – the national body of automotive engineers in India. 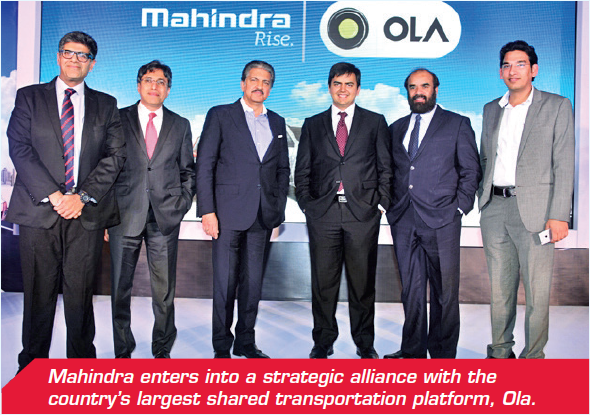 Mahindra & Mahindra Ltd. has signed an MOU to enter into a strategic alliance with the country’s largest shared transportation platform, Ola to empower 40,000 driver partners across India by 2018. Through this strategic alliance the partnership aims to achieve overall vehicle sales and financing of over US$ 400 million (INR 2,600 crore). Ola’s driver partners can now avail of an integrated and attractive ‘Mahindra-Ola’ package which will include Mahindra cars at special prices, attractive financing with zero down payment, and the best NBFC interest rates, subsidized insurance premiums, comprehensive maintenance packages, as well as exclusive benefits on the Ola platform. people everywhere, offering the advantage of low-cost, proximate manufacturing. The Mahindra Group has now designed and implemented a pilot project to bring its benefits to semi-urban and rural India. The project envisages placing 3D printers in a semi-urban / rural setting to enable learning, innovation and potential creation of additional employment opportunities. The Group has thus, presented the B.M. Pawar School in Chakan with 3D printers and has also developed a comprehensive programme to enable students and teachers to realise the true potential of this technology. the enigmatic 15th century mystic-poet. The Mahindra Kabira Festival which was held from November 4th to 6th, 2016, offered an immersive experience of imbibing Kabir’s philosophies and the lyrical aspect of his teachings. 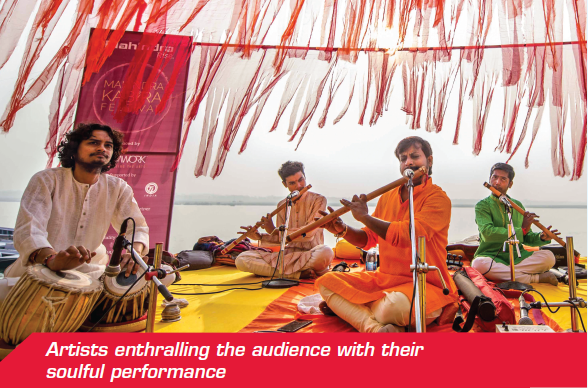 The Mahindra Group and Teamwork Arts had crafted the unique annual festival packed with inspirational music, heritage walks, literature sessions, food and yoga. Visitors, music-lovers and spiritual-seekers got an unforgettable experience of listening to the leading exponents of the Benares gharana and luminaries of Sufi, dadra, thumri, khayal gayaki styles among others. The HR Academy of Mahindra Leadership University held a flagship program for Leaders titled “Leveraging HR For Sustained Business Outperformance” on September 1st & 2nd, 2016 at MLU Nasik. The program aimed at building capability in Business Managers to leverage HR processes to Attract, Retain, Engage and Develop their team members for sustained business outperformance and appreciate a ‘People First’ orientation. The interactive sessions were led by practising business leaders such as T. V. Narendran, MD, Tata Steel; Anand Nayak, ex-Head HR, ITC Ltd.; Ramesh Iyer, Zhooben Bhiwandiwala, Sangeeta Prasad, Pankaj Sonalkar, Rajeshwar Tripathi, P Nandakumar and Carmistha Mitra . The program received plaudits for its design and practical learning and insights delivered by the eminent faculty. category. Initiated in 2013, the objective of the Mela is multi-fold. It is a platform created to showcase the innovative work done by teams across all levels of the Mahindra Group and is a forum for motivating every team to keep innovating. 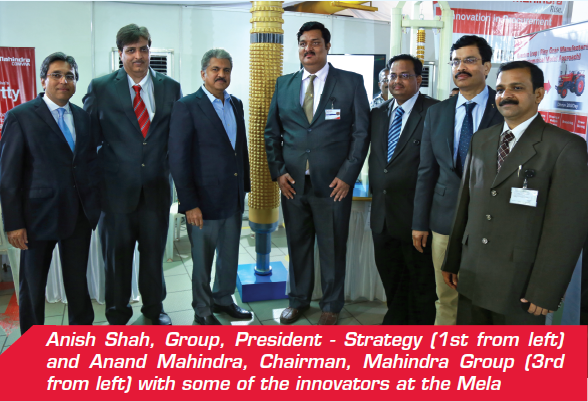 The fourth edition of the Mahindra Innovation Mela saw 31 teams exhibiting their innovation projects to an audience of over 400 Mahindra-ites. The teams put in a lot of effort and creativity in designing their stalls. From elaborate models to neatly adorned kiosks, each stall was a window to the excitement with which the participants prepare for the Mela. measure and enhance their environmental performance. 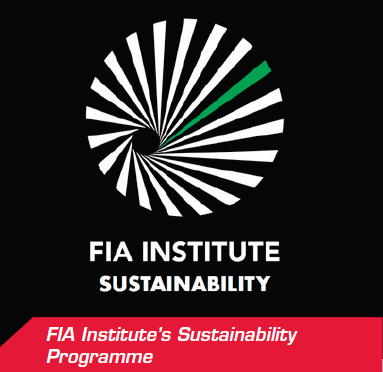 With a clear aim to become carbon neutral from 2018, Mahindra Racing is just the second motorsport team in the world to be accredited. 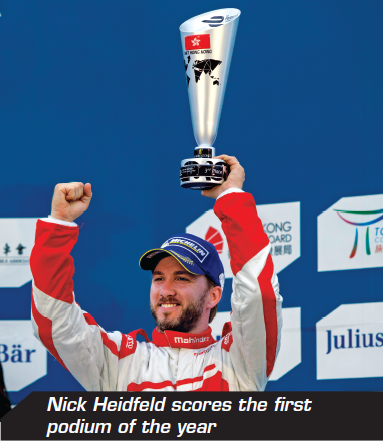 The San Marino GP marked an important milestone for the only Indian constructor in the World Championship. 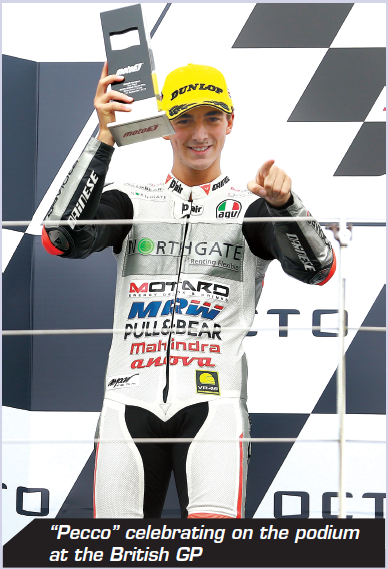 This race marked Mahindra’s 100th Grand Prix start since entering the MotoGPTM World Championship Series in 2011. To celebrate the occasion in style each rider on the 11 MGP3O bikes, nine Mahindras and two in the colours of sister brand Peugeot Motocycles, proudly carried the Indian flag and took to the track for a parade lap. Wildcard entry Stefano Manzi, who produced a famous ride from 34th to 4th at the British GP, rode with the colours of the Indian flag on his MGP3O on race day. Francesco “Pecco” Bagnaia fought to a brilliant second place finish in a hold-your-breath Moto3TM battle at Silverstone, finishing less than two tenths of a second away from victory. The Italian teenager had started from his first pole position, and fought every inch of the 17 laps of the long British circuit to stay at the front of a massive group. when he also finished third during the second round. The results have underlined the team’s hard work on the all-new M3Electro racecars and elevated Mahindra into the global spotlight. Aspar Mahindra Team’s Francesco ‘Pecco’ Bagnaia surged to his second and the MGP3O’s third win of the 2016 season at the Malaysian GP, taking the lead on lap two, then surviving a race of attrition as his closest rivals joined an ever-growing crash list. The 2016 year finished on a high with Bagnaia securing fourth place in the Riders Championship. It also marked Mahindra Racing’s best result to date in the Riders Championship. With 211 points, 2016 proved to be the most successful year as a constructor too. meeting farmers and Government officials, and analysing the on-ground situation, the TRRINGO team realised that the ideal solution to this problem would be to collaborate with Dashmesh and make their Happy Seeder available on rent. Thus, the idea was to provide a special type of seeder which can sow seeds in between the stubble, removing the need to burn the stubbles. Currently being sold in Punjab and Haryana, the product has been a hit with farmers and keeps the environment happy too. 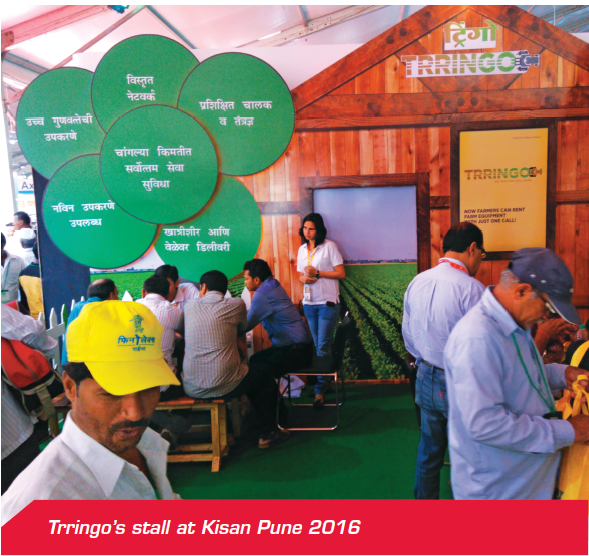 In order to spread awareness about the offerings, Mahindra Trringo was exhibited at the Kisan Pune 2016 edition. The average footfall to the stall was about 50,000 per day and there were nearly 10,000 business enquiries. Over 1000 farmers registered for updates, while more than 250 farmers expressed interest in renting out tractors through Trringo. In FY2014, the Mahindra Farm Division had launched a web-based Dealer Direct portal, which has played an important role in connecting with the end customer and resolving grievances. Keeping up with the times, the team has now launched the DealerDirect App. The app is compatible with Android and iOS and is now available for download on both the Google Play store and the Apple store. Apple store. 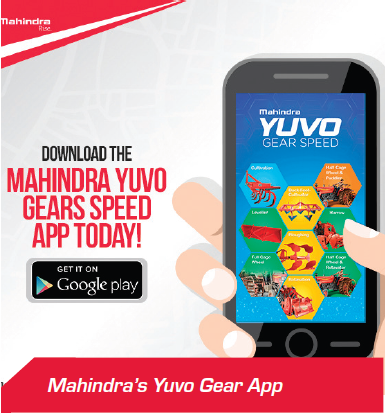 The team has also launched the Mahindra Yuvo Gear App, which assists Yuvo customers to select the right gear options based on geography, soil type and implement. This enables customers to do better and faster work on their fields. With increasing energy demand in a scenario of dwindling petroleum resources and global warming, exploring other avenues for eco-friendly fuels has become quintessential. At the time when Mahindra World City (MWC), Chennai was struggling with food waste disposal, Mahindra Research Valley explored all possibilities of disposing the organic waste in a scientific manner, consequently leading to production of biogas. The first Biogas plant by Mahindra & Mahindra was set up in MWC Chennai in September 2014 and inaugurated in October 2015 by Mr. Piyush Goyal - Minister of Power, Coal, New & Renewable energy, Government of India. With its engineering excellence, Mahindra & Mahindra has proved the benefits and unexplored potential of biogas utilisation by installing the MWC biogas plant with purification system to produce bio-CNG gas, equivalent to CNG gas to be utilized in vehicles and tractors. 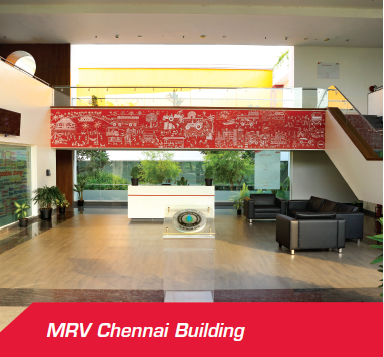 As per the Indian Green Building Council (IGBC) assessment and ratings, Mahindra Research Valley, Chennai has been featured amongst the top eco-friendly buildings in the country, thus making it in the 2nd edition of the IGBC Coffee Table Booklet. The platinum rated Mahindra Technical Academy (MTA) building treats 100 per cent waste water generated within the site. It has reduced potable water usage by 40 per cent and has achieved a 26.6 per cent reduction in utility bills through an energy efficient design. MTA has also installed a 60 kW of solar photovoltaic (PV) for on-site renewable energy generation. 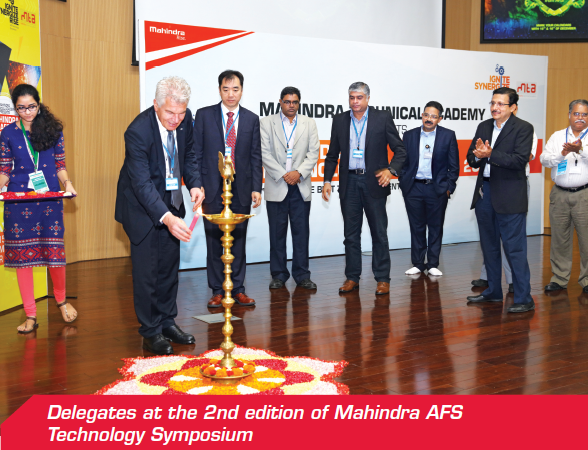 Mahindra Research Valley organized one of the most awaited technical events of the year, the second edition of the Mahindra AFS technology symposium on December 15 and 16, 2016. The symposium focused on new technologies and innovative ideas in the automotive and farm domains. The objective of the symposium was to allow the audience to reflect on the innovation and disruptive potential of newer ideas and technology respectively. For the first time, the Technology Symposium witnessed a convergence of experts from industry and academia like Hubert Friedl, Global Product Manager for Gasoline engines, AVL Germany; Xiangdong Xu, Engineering Director- Asia Pacific, PTP PBU and PT E&E PBU, Delphi Powertrain Systems; Kaushik Madhavan, Head Mobility Practice (Auto) for MENASA region, Frost & Sullivan; Prof. Satyanarayanan Chakravarthy, Coordinator, National Centre for Combustion Research and Development (IIT Madras) and the Centre of Propulsion Technologies with DRDO support and Prof. Anindya Deb, Professor at the Centre for Product Design & Manufacturing, Indian Institute of Science (Bangalore). Xi’an, China in October 2016. If built, the JV will be SsangYong’s first overseas production base. Under the deal, both companies will study the feasibility of constructing production facilities for completely built-up (CBU) vehicles and engines in the Xi’an Economic and Technological Development Zone. SsangYong will also review its plan to establish an automotive cluster there with its parts suppliers in a bid to boost product competitiveness and produce its lineup and future models under development. The Eleventh batch of MPOWER - the Management Development Program for the Nextgen Youth Transport Entrepreneurs was conducted from November 19 to 26, 2016 at the Indian Institute of Management, Ahmedabad (IIMA). The batch consisted of 13 participants from 12 cities and 13 load segments with a cumulative turnover of INR 1440 crore and owning over 1950 trucks. Launched in 2013, 11 editions of the MPower programme have witnessed around 291 participants cumulatively with a combined turnover of INR 25,000 crore and employing over 67,000 people. MPOWER was designed with a vision to provide a platform to cater to the learning needs of the young, nextgen transporters. The curriculum is designed to include aspects facilitating transport business decisions. This helps the young transporters make better informed decisions to take their business to the next level of success. Mahindra Adventure’s Super XUV 500 triumphed at the ‘Rally of Maharashtra 2016’, the second round of the Indian National Rally Championship (INRC) held at Nasik. The diesel powered Mahindra Adventure Super XUV 500 driven by Gaurav Gill and co-driver Musa Sheriff took the top honors at the ‘Rally of Maharashtra 2016’. On the other hand, team- mate Amittrajit Ghosh and co- driver Ashwin Naik, gave a fantastic performance by finishing 3rd overall despite enduring three punctured tyres during the rally. The second round saw participation from 38 teams who had to cover a distance of around 400 km. Since its entry in 2013, team Adventure has been setting the trails ablaze with 11 victories in 15 INRC events. This is the team’s second victory of the season, the first one was at ‘Rally of Coimbatore’ where the Super XUV 500 finished 1st and 2nd overall. P4 variant ex-showroom Delhi, post state subsidy and FAME incentive). On a full charge, the Mahindra e2oPlus can travel for upto 140 kms and can achieve a top speed of 85 kmph. Powered by the latest electric drive train technology from Mahindra Electric, the e2oPlus can effortlessly cruise through city traffic and drives Mahindra’s vision of the Future of Mobility. The tall-boy design and spacious interiors make for a compact city car that can comfortably seat four adults. Sakshi Malik with the Thar. 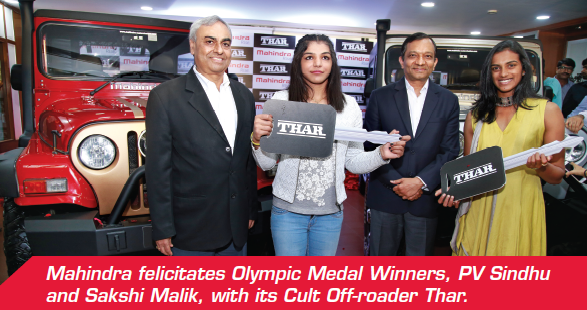 Dr. Pawan Goenka, Managing Director, M&M Ltd., handed over the keys of the Mahindra Thar to the two sportspersons at a felicitation ceremony held at the company’s manufacturing plant in Kandivali, Mumbai. The ‘Mahindra Thar’ is an ideal vehicle for India’s Olympic champions, who, with their explosive performances at the Rio Olympics captured the imagination of one and all. and relevant partners across products & services, and enter into previously untapped segments using iconic brands like BSA and JAWA. Both BSA & JAWA have heritage value and a strong consumer following in many parts of the world. BSA, which has a global appeal will be primarily suited to international markets, and JAWA with its cult following in India is more suited to the domestic market. Classic Legends would leverage the best global capabilities in design and engineering, along with the expertise available at Mahindra Racing’s technical development centre in Italy, to design and launch products that capture the brand DNA and ethos of these iconic brands. Scooters from Paris to Saigon. Inspired by the iconic saga of Serge Gracium and Michel Vaslin, two Petty Officers of the French Navy, who travelled from Saigon to Paris with their Peugeot Scooters S57 in 1956. After 60 years, the idea was to reproduce this journey, but in the opposite direction. The India leg started from September 30, 2016 from Kolkata and rode across the unexplored terrain of North East India to exit from Moreh in Manipur. 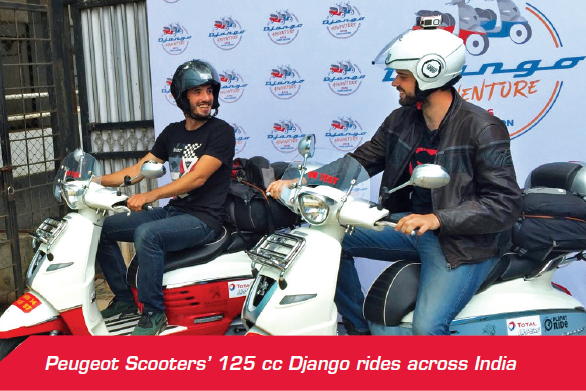 The India leg was across mountains and unchartered forests that tested the riding skills as well as the resolve of the Peugeot Scooters. Mahindra Two Wheelers Limited (MTWL) successfully concluded it’s first-ever Mahindra MOJO ‘Coastal Trail’ in October 2016. This trail was simultaneously flagged off from Mumbai and Bengaluru on September 29, 2016 and ended in Dandeli (Karnataka) on October 3, 2016. Riders from Mumbai, Pune, Bengaluru, Chennai and Goa were part of the trail that covered a total distance of 1,350 kms. The Mahindra Design Studio received The International Architecture Award for 2016 from the Chicago Anthenaeum which includes the museum of Architecture and Design and the European Centre for Architecture Art Design and Urban Studies. The International Architectural Awards are the highest and most prestigious distinguished building awards programme that honor new and cutting edge design and promotes international architecture and design to the global audience. This year, the museum received a record number of projects for new buildings, landscape architecture and urban planning from prestigious firms practising globally. The jury selection took place in Milan during the 15th Venice Architecture Biennale and 130 projects from over 40 nations were selected by a distinguished group of Italian architects, journalists and educators. The CSIR Diamond Jubilee Technology Award (CDJTA), for the year 2016, has been conferred on Mahindra Electric, Bangalore for "Design and development of the electric car named e2o". The Council of Scientific and Industrial Research or CSIR honoured Mahindra Electric for an assertion of the country's innovation consolidated into the design and manufacturing of the e2o. Ashish Tarte, Head Engineering & Development and Pavan Sachdev, Sr. GM, Group Public Affairs, received the award on behalf of Mahindra Electric representatives during the ceremony, held on CSIR Foundation Day, September 26, 2016. The event was graced by Hon’ble Prime Minister, Shri Narendra Modi, as the Chief Guest. 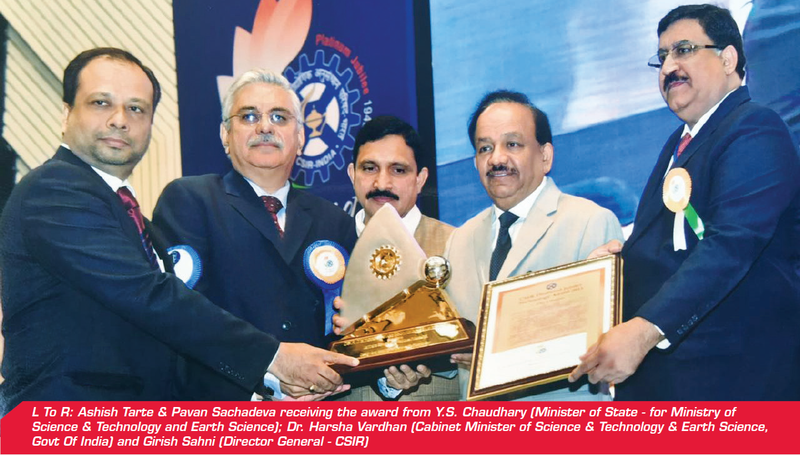 Dr. Harsha Vardhan, Cabinet Minister of Science & Technology & Earth Science and Girish Sahni, Director General – CSIR handed over the award to Mahindra Electric. In recognition of its sustained and relentless drive to save CO2 emissions and protect the environment, the mDURA engine....with Innovative Feed Pump Control FIE System’ was conferred the prestigious Golden Peacock Eco Innovation Award 2016. The award jury committee, chaired by Justice M. N. Venkatachaliah - Chief Justice, Supreme Court of India, chose mDura among 1000+ applications globally. Mahindra Research Valley was recently awarded by The Madras Voluntary Blood Bureau and The Association of Voluntary Blood Donors for its outstanding efforts in organizing a blood donation camp. The award was given away under the category “mobilizing 200-500 donors” under the blood donation drive. days and 30 seats per batch. Qualified ASBM candidates may get an offer to associate themselves with MFCS as Franchisee Partner. The course provides an introduction to the automobile service industry and informs the candidates about the recent trends, scope and opportunities. 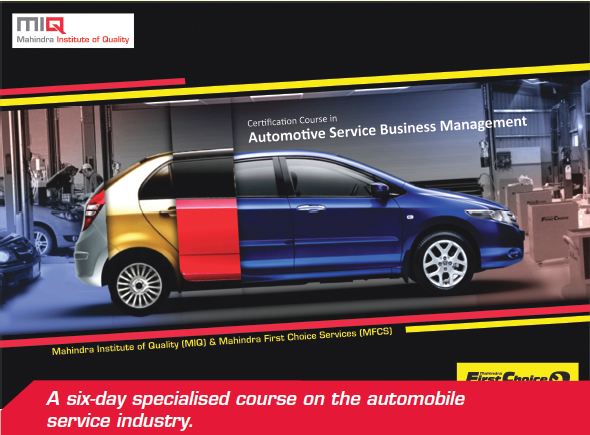 The course also focuses on setting up car service workshops, customer relations, achieving operations excellence, cash flow management etc. servicing insurance claims of customers of RICBL in India against which the latter has agreed to provide claim facilitation fees to MIBL on a per case basis. This is the first of its kind of agreement between an Indian Insurance Broker and insurance company based outside India. 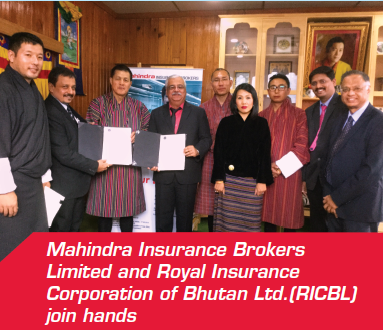 This sign-off has further helped MIBL to start a reinsurance business with RICBL. 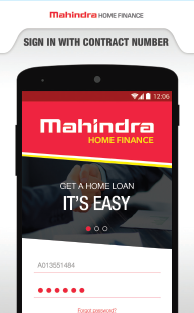 Given the current thrust of the government on going digital, Mahindra Rural Housing Finance Ltd. (MRHFL) launched a mobile app in the last week of December, 2016 for all its current customers. This move is aimed at providing the much needed impetus to digital banking modes across the country. Through this application, a customer can check the statement of accounts, refer new customers, raise a request or a complaint, check payment details and check loan details. Earlier in the year, MRHFL had launched the Toll Free customer call center and with this step, the company is following a two pronged digital strategy to meet the needs of the customer in an efficient manner. Mahindra Mutual Fund launched its second product of this Financial Year; the ‘Kar Bachat Yojana’. It is an open ended ELSS scheme with a three year lock-in period. Since investments in this scheme are entitled to tax deduction under Section 80C and even redemptions are tax free as per the extant income tax laws in India, this product is ideal for all working professionals. The scheme received a huge response from all parts of India. When the NFO closed on October 7, 2016 the scheme had garnered more than INR 117 Crore of collection from about 17,000 investors across 610 locations. Nearly 700 distributors had joined hands with Mahindra Mutual Fund in making this NFO a huge success. Around 811 companies from 22 countries were invited for disclosures from Emerging Markets. Ninety-five made it to the list of which 10 were from India with three being from the Mahindra Group. 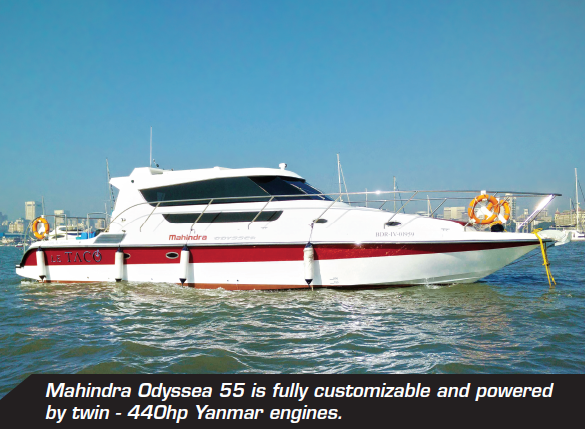 series speed boats, and offers a host of customization possibilities to Indian boating enthusiasts. The world class luxury yacht, crafted by Indian engineers is fully customizable and powered by twin - 440hp Yanmar engines. It has a well-engineered shaft propulsion system from Michigan Marine and trickle charging solar panels mounted on the roof as a safety and green initiative. “Built to suit Indian conditions, the yacht embodies Made in India in its true form, even as it draws from global design expertise and Mahindra’s proven engineering skills,” said Hiten Ghelani, CEO, Mahindra Marine. 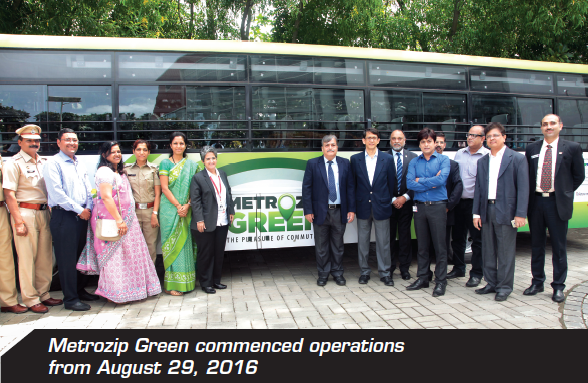 ‘MetroZip Green’, the latest offering by Mahindra Logistics under their People Transport Solutions business, was launched on August 18, 2016 in association with Hinjewadi Industrial Association (HIA) and MIDC, Pune. This service is exclusively designed for 69 member companies of HIA with over three lakh employees. The service commenced operations from August 29, 2016. MetroZip Green offers a hassle free solution for the daliy commute along with unique features like Wi-Fi on the move, GPS tracking and spacious interiors. 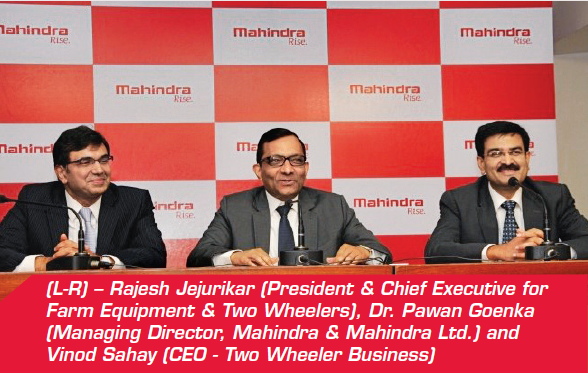 This offering marks Mahindra Logistics’ foray into the B2B2C category. An extensive marketing campaign was rolled out as a pre-launch, between July 23 and August 12, 2016, generating over 3,000 leads. Mahindra Lifespaces was recognised as one of the 100 most sustainable corporations across Asia in the 2016 edition of the Channel NewsAsia Sustainability Ranking. Mahindra Lifespaces ranked at No. 28 on the 2016 list, from the 2015 rank of 56, was acknowledged for its performance in the areas of product sustainability and human capital development, among other considerations. It has also ranked No. 2 in Asia in the Diversified/Listed category of real estate companies, in the Global Real Estate Sustainability Benchmarking (GRESB) report. GRESB is a Netherlands headquartered, industry-driven organisation committed to assessing the sustainability performance of real estate portfolios around the globe. Nearly 1,100 companies and funds have been assessed globally by GRESB. road and rail. Now, the MWC is home to a brand new hostel for single working executives. Spread across one acre, the hostel named ‘Downtown’ will have 200 rooms on twin sharing basis, and multiple amenities including a cafeteria, gymnasium and in-house laundry services, among others. 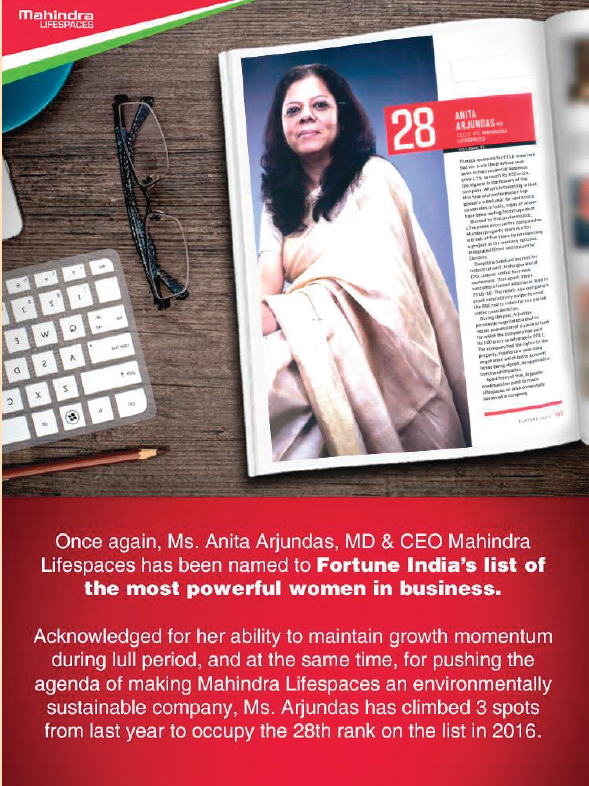 Once again, Anita Arjundas, Managing Director, Mahindra Lifespaces, has been named on Fortune India’s list of the most powerful women in Indian business. Acknowledged for her ability to maintain growth during a lull period, and, at the same time, for pushing the agenda of making Mahindra Lifespaces an environmentally sustainable company, Arjundas has climbed three spots from last year to occupy the 28th rank on the list in 2016. In November 2016, Mahindra World City (MWC), Jaipur announced the launch of Phase 2 of its Domestic Tariff Area (DTA). MWC Jaipur is today the preferred business destination for more than 65 leading global and Indian companies, of which 26 are located in the Domestic Tariff Area. MWC Jaipur has also recently got SHV Energy on board its DTA Phase 1. SHV is a Netherlands headquartered conglomerate and a global leader in specialized energy product categories. SHV intends to augment its reach in North India by setting up a 5.4 acre world-class plant in MWC Jaipur. Additionally, Rajendra and Ursula Joshi Food Industries Pvt. Ltd. and Chokhi Dhani Pvt. Ltd., have recently taken up an additional 11.33 acres and 3.2 acres respectively in DTA Phase 1, for expansion into dairy products and ready to eat foods. 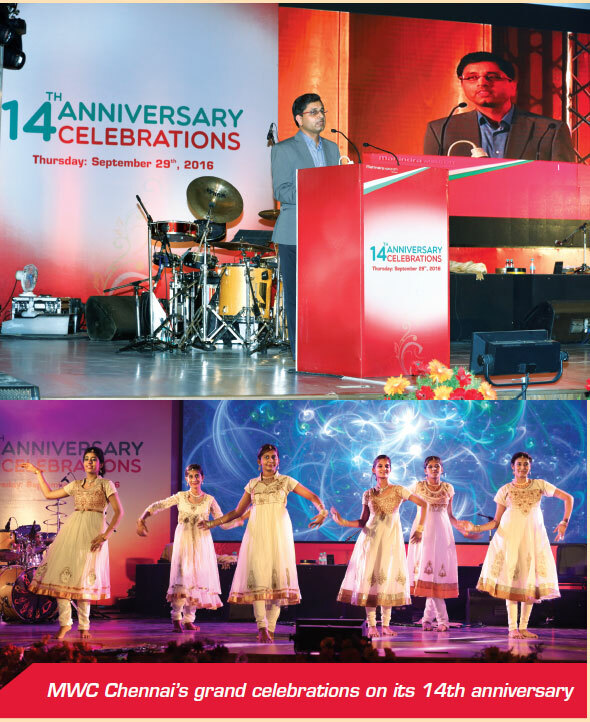 Mahindra World City (MWC), Chennai celebrated its 14th anniversary on September 29, 2016. The celebrations began with a traditional lamp lighting ceremony, and included the felicitation of the winners of the Champions Trophy - MWC Badminton Tournament, and the first ever MWC Photography Contest. Mahindra World School students put up a specially choreographed performance. The highlight of the evening was ‘Jugal Tarang’, a unique alliance of classical, ethnic fusion and contemporary music. Mahindra World City (MWC), Jaipur, began its journey with a dream to transform the urban landscape to create sustainable communities thus creating economic nerve centres of development and new urban nodes. MWC Jaipur is a joint venture between Mahindra Group and the Rajasthan State Industrial Development and Investment Corporation Ltd. (RIICO), an agency of the Government of Rajasthan working together towards a common goal of transforming Rajasthan into an industrial destination of choice. Since then it has been 10 years of transformation! As MWC Jaipur completed 10 years of its development journey in Rajasthan, stakeholders, local communities and team members came together to celebrate the milestone. A photo contest was organised for customers, plus handicraft classes, pottery classes and bangle making sessions served to bring together the vibrant industrial community on common, creative grounds! 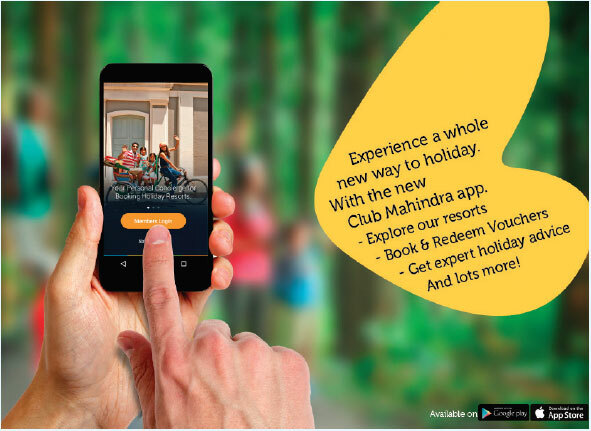 Club Mahindra launched a new brand campaign, OnlyAtClubMahindra in December 2016. The campaign emphasises the thought that taking regular vacations can bring families closer. Shot at the Club Mahindra resort in Ashtamudi, the campaign focuses on the idea that parents can rediscover the child in themselves when they become friends with their children as they bond over shared experiences. This central thought has been brought to life by showcasing the many diverse and unique activities offered at several Club Mahindra resorts. For instance, the first ad in the series shows a family staying in one of the floating cottages at Club Mahindra Ashtamudi fish in the lake right outside their window with unexpected consequences! This results in much laughter and fun, bringing them closer together. The campaign was rolled out across multiple channels, with special focus on digital. The brand film was an instant hit on the digital platform and garnered over one million views within a week of its launch. interact with the brand for all their basic requirements such as making bookings, making payments, submitting queries / complaints, managing their accounts, offer redemption, referral, hitherto addressed on the website or at the call center. In addition to these, the app will offer a whole lot of new services to members, such as concierge, pre-check-in, real time in-resort service request, posting of photographs, airport transfer, etc. The app has seen close to 70,000 downloads since its launch. city councils with technology platforms and products and solutions that will help cities address their current and potential issues. The campaign aims at resolving issues like air pollution, vehicular traffic, water scarcity and power distribution among others. The focus remains to make our world a better place to live in. Brands undergo transformation and logical extensions of their philosophies. Tech Mahindra has done so too. It refreshed its brand philosophy and the new one reads: Connected World, Connected Experiences. 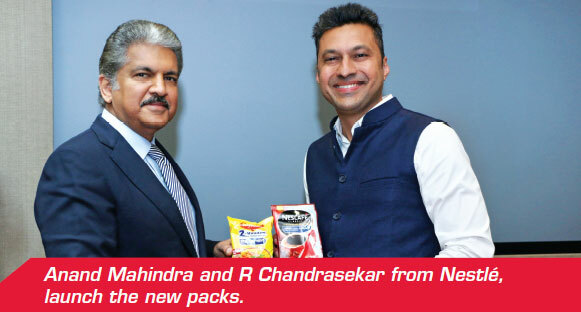 Tech Mahindra foresees a new demand for ‘connected experiences’ playing across all industries. Hence, the Company has embraced the philosophy of the hyper-connected world and appreciates that the new revolution is going to be powered by an intelligent symphony of solutions and designing “experiences”. three Indian companies) and DJSI Emerging Markets (becoming one amongst ten from India) categories. S&P Dow Jones Indices, the world’s leading providers of financial market indices, and RobecoSAM, an investment specialist focused exclusively on Sustainability Investing, announced the results of the annual Dow Jones Sustainability Indices (“DJSI”) review. Business Today, India’s leading business magazine named Tech Mahindra’s C.P. Gurnani the CEO of the Year in the IT / ITES industry. 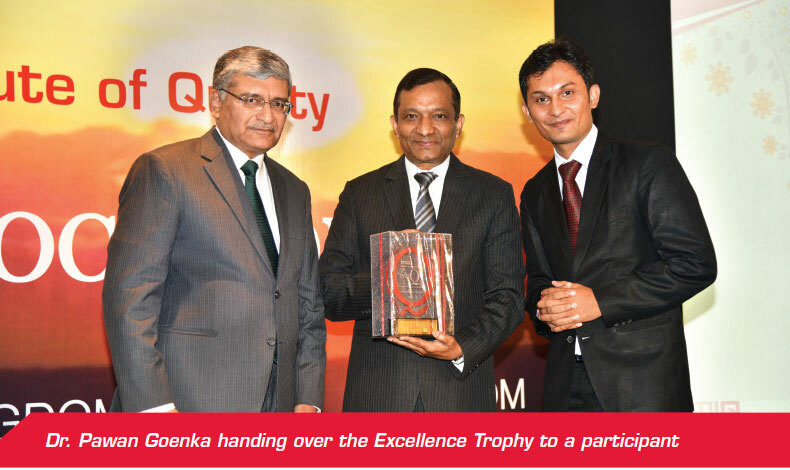 As the happy news came towards the close of 2016, Gurnani accepted the honor on behalf of the entire Tech Mahindra family. is to be deployed during the special surgical strike operations in a hostile environment. 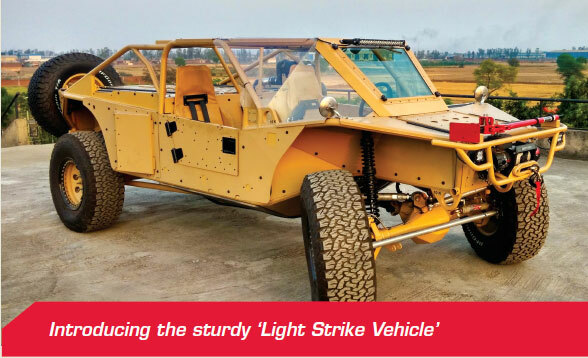 The vehicle has a multi fuel 3.2 Lt. 215 hp diesel engine, six-speed automatic transmission and 4x4 transfer case fitted inside a custom designed rugged space frame chassis. It is capable of climbing over a 30 degree gradient, 300 mm vertical obstacle, 45 degree of side slope, crossing through 500 mm water and achieving over 120 Kmph of speed. It was a proud moment for Mahindra Defence Naval Systems when the Indigenous system prototype of 155mm Advanced Towed Artillery Gun System boomed through its successful trials. A critical Recoil system of the gun was manufactured under the watchful eyes of the scientists of the prestigious Armament Research and Development Establishment who evaluated the system as per tough acceptance standards. The unit is proud of being a valuable contributor to the country’s defence and the technical excellence demonstrated by the team in this challenging assignment. Mahindra Defence, in collaboration with Tech Mahindra and Mahindra Auto, successfully implemented the world’s largest 24x7 citizen-centric Police Emergency response system for the Government of Uttar Pradesh. The UP 100 has already helped 2,12,424 personnel across the state since its launch 50 days ago. The average response time achieved for four wheelers to attend to emergencies in urban areas is 15 minutes while in rural areas it is 20 minutes. The project aims to cater to 22 million people and covers 75 districts. The UP 100 vehicles are equipped with GPS, mobile data terminals and very high frequency (VHF) radios. The project has received widespread appreciation from the general public and various specialists and politicians. 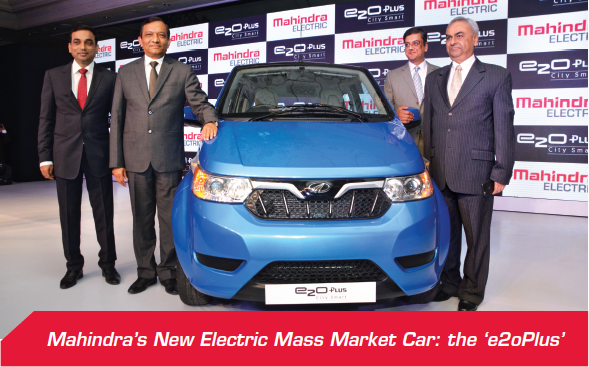 The project has been launched with 3,200 four wheelers out of which 2500 are Boleros provided by Mahindra. 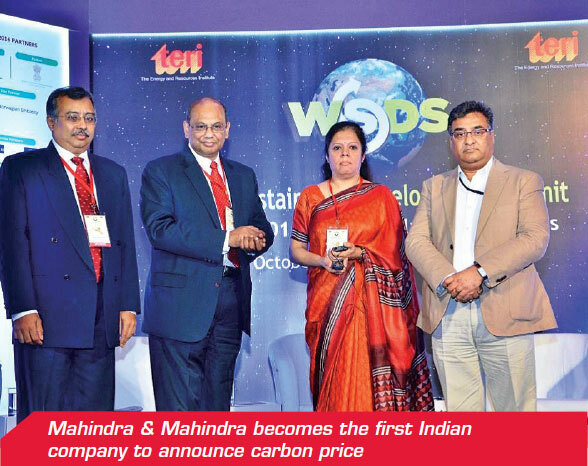 On Wednesday October 5, 2016, Mahindra and Mahindra became the first Indian company to announce a carbon price of $10/ton of carbon emitted. The carbon price reflects the investments that will be made to reduce the carbon footprint of the business. Carbon pricing is a business tool that enables the company to invest in low carbon technologies to reduce future emissions and also operating costs. The announced carbon price is in line with the business’ commitment to reduce 25% of specific GHG emissions over the next three years. The company is committed to double energy productivity by 2030 and be the first global signatory of EP100, a program promoted by the international non-profit, The Climate Group. It is also the first Indian company to join World Bank’s “Carbon Pricing Leadership Consortium” which was launched at COP21 in Paris. Group to join the campaign, the first being Mahindra & Mahindra Ltd. which signed up in May 2016. EP100 is a global campaign to encourage the world’s most influential businesses to commit to doubling their energy productivity and maximize the economic output from each unit of energy utilised. To join the campaign, companies must commit to double their energy productivity by 2030. The campaign is led by The Climate Group and is an action of the We Mean Business coalition. EP100 also operates in collaboration and alignment with The Global Alliance for Energy Productivity and the United Nations “Sustainable Energy for All” initiative. Energy is the lifeline of every industry, but it comes at a price, a commercial price and an environmental price. To stay commercially competitive and environmentally sustainable, it is important to maintain an unwavering focus on our energy consumption. Putting this thought in practice, Mahindra Institute of Quality (MIQ) and Group Sustainability conducted the fourth batch of the training course ‘Energy Management – The Mahindra Way’ at MIQ, Nasik on September 22-23, 2016. Internal faculty from M & M, Susten and Powerol touched upon topics like carbon neutrality, energy productivity, solar applications for businesses etc. External faculty from several companies, namely Schneider Electric, Grundfoss, Philips, Atlas Copco, Ecofirst, Blue Star and Thermax also shared their knowledge on topics like energy management systems, harmonics, green buildings etc. Tech Mahindra employees have always been responsible citizens and the news about farmer suicides due to the worst drought in Maharashtra led them to join hands with the NAAM Foundation headed by actors Nana Patekar and Makarand Anaspure. The employees contributed to the foundation’s tree plantation and nurture programme in Maharashtra. The Green Thumb Programme by NAAM involved planting trees in the interior of Maharashtra and our associates donated freely and raised INR 48 lakh to help the drought affected villages. More than 100 employees from Tech Mahindra’s Rise4Green team visited the village of Gogalgaon in Ahmednagar district to plant these trees in July. Group President (HR and Corporate Services) and CEO (After-Market Sector) awarded certificates to 34, 7 and 24 participants of the PGDQM-Manufacturing, PGDQM-Service and PGDOM programmes respectively. Dr. Goenka also launched the MIQ website and brochure during the ceremony. K C Mahindra Education Trust’s (KCMET) Mahindra All India Talent Scholarship (MAITS) has been set up to empower students from the disadvantaged sections of our society. It is given to students belonging to low income families, who wish to pursue a job oriented diploma course at a recognised Government Polytechnic. Every year 550 students are given this scholarship for a period of three years. To be eligible for this scholarship, the students should have passed class 10 / 12 or equivalent examinations and have secured admission in a government recognised Polytechnic Institute across India. KCMET creates awareness about the scholarship by releasing advertisements in 10 languages across India. This year the interviews were held in 11 centres across India by a diverse panel comprising of educationists, NGO programme experts and Mahindra executives. Of the 6,110 applications that were received, 849 students were called for interviews and 550 were awarded the scholarship. These students come from rural, tribal, semi-urban areas and small towns from all corners of India. 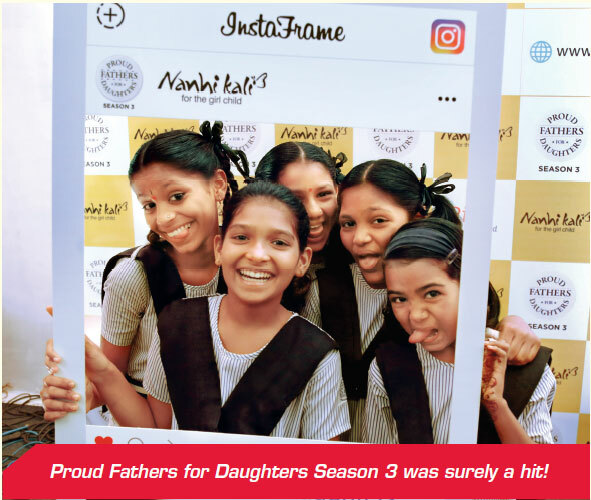 Three years ago, a spontaneous conversation between Anand Mahindra and renowned photographer, Atul Kasbekar, led to a path-breaking event called ‘Proud Fathers For Daughters’. Since its inception in 2014, the cause has celebrated the endearing father-daughter bond. This year too, the two-day event brought together three eminent photographers and 114 doting fathers with their daughters, to capture their precious bond in timeless pictures. This impressive turnout has helped raise funds to educate 275 underprivileged girls with academic, material and social support. The event that filled Mumbai’s Mehboob studio with joy, love and laughter was a huge success. A big thanks to everyone involved in making it so with special thanks to the event sponsor, Mahindra Rise. The 178th Lifeline Express Project by Impact India Foundation and the 17th project supported by Mahindra Group recently concluded at Satna, Madhya Pradesh. This Project was supported by AFS, which treated patients with cleft lip surgeries, hearing related disorders, dental, eye related disabilities, family planning & gynaecological ailments and oral cancer, breast & cervical cancer. The Project witnessed around 11,419 beneficiaries as compared to LLE Ghazipur’s best which saw 9007 beneficiaries in December 2015. 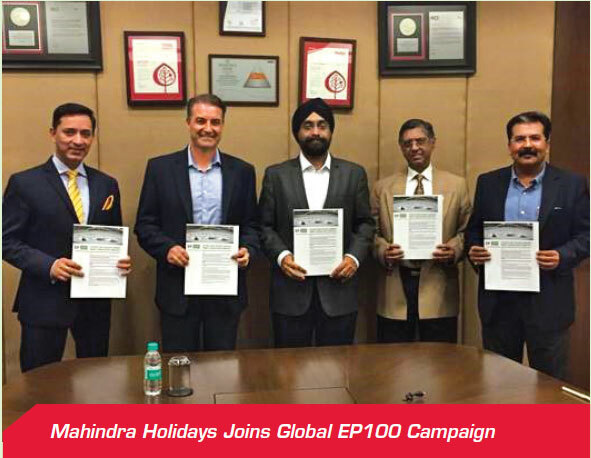 Mahindra Group became the first corporate to sponsor a seven-coach Lifeline Express in India as two new coaches were added during the course of this project. The first cancer surgery on a train was conducted successfully during the Project at Satna by Dr. Pankaj Chhatturvedi from Tata Memorial Hospital, Mumbai. the critical issue of girl child education in India. The partnership began with the launch of the campaign #EducateTheGirlChild and with a broadcast of the Nanhi Kali TVC across social media platforms such as YouTube, Facebook and Twitter and over 14,000 TV spots across mainline TV channels. To further highlight the cause, Nestlé India also partnered for native content with several media channels. The next phase of the partnership saw Nestlé India changing the messaging on the packaging of three of their most iconic brands - Maggi, Nescafe and Kit-Kat in support of girls’ education. Maggi changed its tag line from “2 minute noodles” to “2 minutes for education”, Kit Kat changed the visual of the finger snap to one with the tagline “no break from education” and NESCAFE changed the tagline “It all starts with a NESCAFE” to “It all starts with education”. Nestlé India continued to support #EducateTheGirlChild by recreating the iconic song ‘School Chale Hum’ with Shankar, Ehsaan and Loy, lyricist Anvita Dutt, singer Harshdeep Kaur and our Nanhi Kalis lending their voices to a rousing effect. 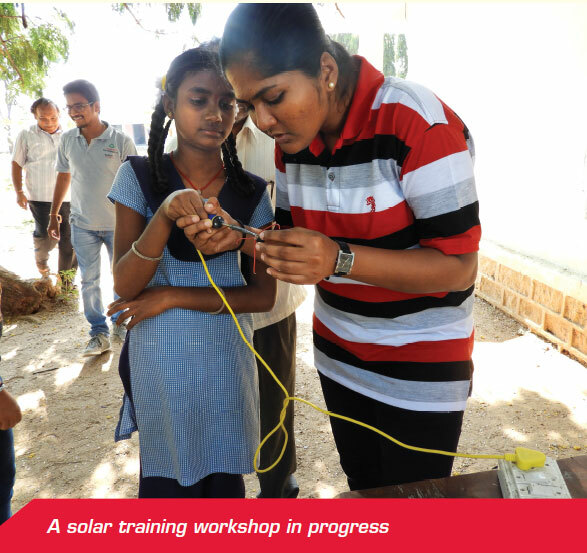 Mahindra Susten organized a solar training program from December 20 to 21, 2016 for 150 students in three schools of Mahabubanagar with an LED Safari. The training was centred on creating a solar LED lamp from scratch. The students were exposed to the working and assembling of a solar lamp, making the circuit, soldering the connections and finally adding finishing touches to the lamp! Mahindra Susten’s enthusiastic employees volunteered for the ‘Hamara Station Hamaari Shaan’ initiative by Mumbai First and Making A Difference (M.A.D) who came together to beautify the suburban railway stations of Mumbai. The Project, as part of the Swachh Bharat Mission, was undertaken in collaboration with the Western Railway and Central Railway. The aim was to beautify the railway stations and be a part of this unique and sweeping initiative. Employees from Susten volunteered on October 5, 2016, to change the complete panorama of Andheri Station. The beautification involved painting of the entrance, signage, booking office walls, foyer, staircases and pillars. The activity recorded more than 341 ESOPs hours. Club Mahindra, Mashobra has initiated a computer lab at Kasturba Gandhi Ashram, an orphanage with 46 inmates within the age group of 4-15 years. Employee Social Options (ESOPs) volunteers from the resort visit the home every week to impart computer skills to the girls and help them become self-reliant. The ESOPs team’s future aim is to help develop necessary infrastructure in the Ashram and also provide necessary skill training to the girls. Depending on the success of the current project, tailoring and bakery units will also be initiated. The ESOPs team members also participated in a 12 kms cycle rally to spread the message of environmental conservation. is being taught technical aspects, communication effectiveness, personal grooming and entrepreneurship skills. There has also been a conscious effort to provide them with a nutritional diet which supplements the fitness training regime. Additionally, the women are being trained in Budokai martial arts and have received Green Belt certification. Moreover, they were taken for their site training to the 100MW Mahabubnagar and 200MW Ghani site for ten days to get hands on training on all concepts of solar along with exposure to CSR activities. The skilled team has accomplished over 300 hours of training, and are well on the road to emerging as the first all women team of solar energy technicians! On December 11, 2016, Lieutenant Governor Ms. Kiran Bedi announced plans to develop Palayam village in Thiruvananthapuram as a ‘Model Village’ in collaboration with Mahindra Holidays & Resorts India Ltd. (MHRIL). In order to promote Swachh Bharat, the villagers were taught waste segregation by the ESOPs Team in collaboration with the Municipal Corporation. Color co-ordinated dustbins will be provided for the same through MHRIL CSR funds. The first meeting was presided over by the Lt. Governor and attended by Mohanraj and Vasu Babu . destination, but surrounding villages and communities have also been integrated into the City’s development plans and initiatives. MWC Jaipur has partnered with technology business Incubator-KIET, promoted by the Department of Science & Technology, Govt. of India, to design skill development programs for rural communities, thereby improving employability and creating job opportunities. 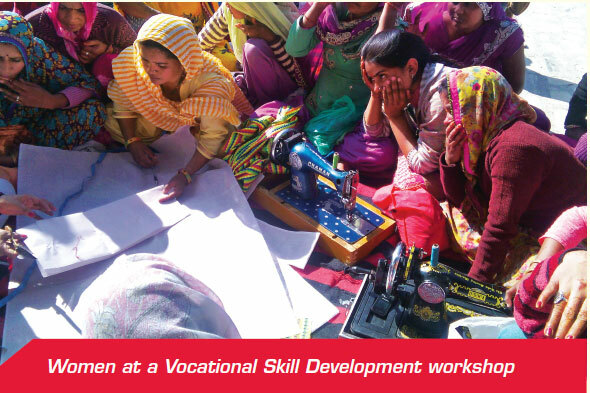 MWC Jaipur also provides vocational/skills training to rural women in surrounding villages/communities. Training modules for formation of Self Help Groups have been designed for rural women, with skill training. Those with entrepreneurial ambitions can apply for loans within the SHG to start their own business or can take up a course. So far, 1125 women have been trained across 85 groups. of increasing access to quality services by offering a well-equipped facility in rural areas and Tier II & III cities. This programme was initiated in the last financial year and has been continued through the current year too with two implementing NGOs. In 2016, Mahindra Finance has primarily focused on equipping diagnostic centres catering to thalassemia, cancer, pre-natal, neo-natal and reproductive healthcare. 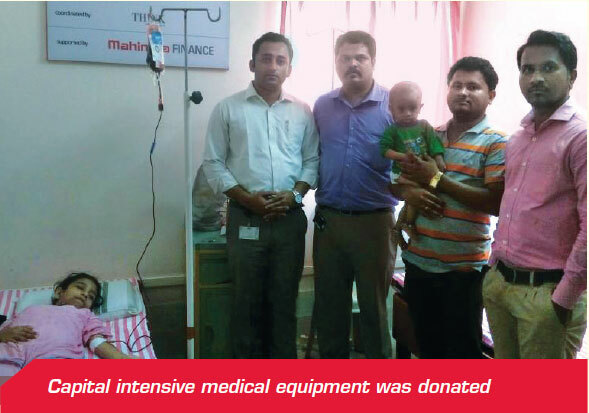 Under the programme, capital intensive medical equipment and surgical procedural tools have been donated by Mahindra Finance. As a part of the initiative, around 110 thalassemia affected children in Jalna and Aurangabad are receiving regular blood transfusion and iron chelation therapy at the Day Care Centre and 80% of beneficiaries reported are rural residents. Suhas Wankhede, DGM- Hydraulics; Suresh Pandilwar, CSR Champion; Kalbande School Principal; Dr. Akshay Dhaga; Dr. Chitra Agrawal and Dr. Vinita Agrawal. 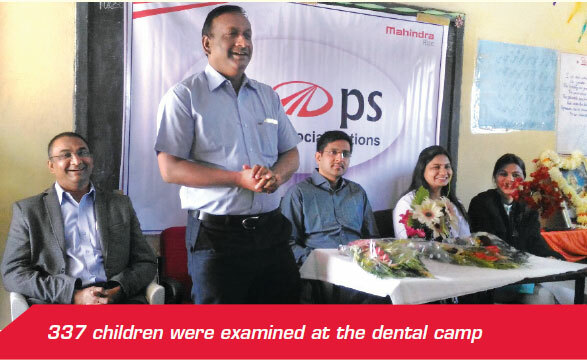 An awareness session was conducted for all school children in which they were educated about dental hygiene. 337 children were examined and were found suffering from various dental ailments like dental fluorosis, scaling, malocclusion and staining of teeth due to bad habits. The ESOPs team from AFS - Zaheerabad in association with the Shankar Netralayam Hospitals, Hyderabad, conducted their 61st eye camp at Adarsha Vidyalaya, Zaheerabad town on November 24, 2016. A total of 629 patients were examined and 364 spectacles were ordered and distributed on December 8, 2016. Dr. Ravindar Goud, Director, Shankar Netralayam, and his team examined the patients and gave their valuable opinion and advice. His team of eight optometrists screened the patients who visited the camp site for visual errors.